I’ve been a fan of the Uncharted franchise for a very long time. I still remember playing the demo for the first game, Uncharted: Drake’s Fortune, at a gaming retailer a ways back. There’s always been something about the series that has attracted me, and I think it’s my love of quality action cinema. The games have always done a great job delivering that summer blockbuster feel, from the more isolated set-pieces of the first to the globetrotting and epic-scaled chases and shootouts of Uncharted 2 through Lost Legacy. I’ve been aching for this franchise to transition to movies for a long time. If any video game series is tailor-made to be a big action flick, it’s Uncharted. There have been several attempts to bring Nathan Drake to the silver screen; the project even has had the likes of Mark Wahlberg and Joe Carnahan attached! Until recently, there hadn’t been a whole lot of movement on the film, but in 2016, Real Steel’s Shawn Levy signed on to direct, and in 2017 he cast… Tom Holland as a younger Nathan Drake. The plan seems to be to make this a franchise for Holland to grow into, which is fine and all, but I both don’t see him as the young adventurer or very much like the idea of a young adaptation of this beloved character. Wasn’t that freaking BRILLIANT? Nathan Fillion absolutely kills it as Nate; he nails all of the mannerisms Uncharted fans will be looking for, he has the sarcastic wit down, and he can even handle himself in a fight scene. He’s genuinely riveting in this role, proving that he might just be the man incarnate. Another stellar piece of casting is Stephen Lang as Sully. I didn’t know I wanted him in the part until now, because he’s perfect as the cigar-chomping badass. His chemistry with Fillion is top notch as well; they bounce off each other as authentically as they do in the games. Elena is barely in the short, but Mircea Munroe does a solid job with what she’s given. I’d like to see this expanded on to get more of an idea of her take on the gutsy reporter. Her back-and-forth with Fillion is decent, but there isn’t much to go on. The rest of the cast, the unnamed enemy faction, are also respectable. From a story perspective, this feels like the opening chapter of a much longer film. It’s incomplete, it’s a teaser, and it kind of feels like an audition – in a good way. The fun starts right at the beginning, with Nate captured by the bad guys after having stolen an artifact that their boss paid for at an auction. (This calls back to the auction sequence from Uncharted 4.) It’s a nice cold opening, but it’s a little disappointing that it ends right when we’re getting into the meat of the story. We finally see Elena, we learn more about the treasure Nate is chasing, we find out where they’re heading next… and then it’s over. I get that they only had fifteen minutes, and they did an excellent job with those fifteen minutes. The way it leaves off almost makes me feel like there’s more on the way. If not, though, it’s a frustrating ending. For what it is, the action featured in Uncharted is well-helmed. There’s a really solid fight sequence, filled with real Nathan Drake fight moves and some strong humor. His brief square-off with the character “El Tigre” is comedy gold, and it features an AWESOME finishing move straight out of the games. Also featured here is the shootout that the director very much structured and shot as if someone was playing a live-action version of an Uncharted game. This doesn’t work quite as well; I can appreciate the craft of the sequence, and I can also appreciate it conceptually, but as an action scene in a film, it feels out of place. I think in order to construct good action in a video game adaptation, you can’t ape the games like this sequence or the first-person scene from Doom. Adapting movements and fight moves is fine – if you aren’t a fan of the games, you won’t notice the tip of the hat – but a sequence like this shootout is clearly made to feel like a different medium and, thus, is pretty jarring. I will say that Nathan Fillion, once again, really nails Drake’s mannerisms. When his pistol is empty, his reaction is just how I’d imagine the character reacting. It makes him feel all the more authentic in the role. From a cinematography perspective, I wouldn’t say Uncharted looks like a big budget picture; more like a high-quality TV show, one that perhaps would be on AMC or maybe even Showtime. The camera moves are well thought out, the fight sequence is well-shot and edited, and overall the film LOOKS like a fun adventure. Musically, it’s nothing to write home about. There’s some solid action music that heightens the intensity, but it’s not anything standout like the score for the games. The sound design is well done, however; guns have a good punch to them, and every fist hits with a really meaty, painful sound. They also did an admirable job mixing. The sound effects and music are never louder than each other, and the dialogue is always audible. Overall, I have to say that I’m incredibly pleased with this fan film. It’s bittersweet, as I know we more than likely will never see Fillion in this role again, but I’m just so happy we even got fifteen minutes of it. 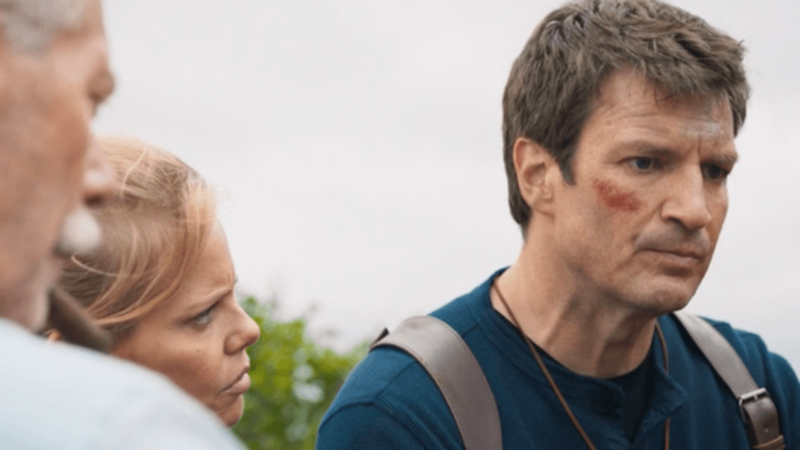 Uncharted is a fan film that understands its source material down to the smallest iota. It’s not perfect; I do take issue with how truncated it feels, and that shootout is jarring. Even with that, this is a must-see for any Uncharted fan and proves the hero’s mantra: Greatness from small beginnings. Uncharted is an adventure true to its source material, with action, an intriguing plot tease, and an all-star performance from Nathan Fillion as everyone's favorite thief. A must-see for any franchise fan.